Hey guys I'm looking at buying a new grill for the house once we get our back deck re-decked and a roof put on. I've been eyeing two different brands and wanted to see if anyone has tried either themselves and get your thoughts about them? The first brand being the Traeger Grill, either the Pro Series 34 or the Select Pro. The second brand is the Green Mountain Grills, likely the Jim Bowie. Anyone of you happen to use either brand? Sorry Mike, I have no experience with any pellet grill/smoker product... I'm a 'stick burner' snob, LOL!!! For what it's worth, some people like them... others regret spending the money on them & go back to a wood smoker. @w_r_ranch I'm assuming this is a personal preference or is there something that makes pellet grills inferior? Like I said, I have no experience with them... It's just what I heard or read on various BBQ/Smoking forums. Some people say these units don't impart the smoke flavor that they are looking for... other people say they like the taste. I was brought up smoking/BBQing the old fashioned way. To me there are no shortcuts & I've always enjoyed the 'old' process of tending the fire, making the coals & managing the pit. Pellet grills are a great do it all tool. Smoke, bake, grill. Most people that own them swear by them. Ask a question like this and you'll get a different opinion for every response. I've used electric, wood, charcoal, propane, and combinations thereof. One thing I learned is that each has its own advantage. Electric is easy, doesn't taste as good. Wood/charcoal taste best, but unless you're spending big bucks on a reverse flow offest like a Lang, you end up babysitting them. Propane is a nice compromise. Another thing that I learned is that people have different preferences in fuel choices, brand, and style of smoker, and it's all good. Whichever one works for you is the one you should use. If you go with a pellet grills, Traeger is tough to beat. The only real downside is being stuck with using only pellets for smoke. Well that's the thing, sure the Traeger and GMG both can smoke, but smoking is not only reason I'm looking at this. Sure being able to smoke is great, but it's primary use will be to grill as well. Would your linked Weber perform equally as well grilling? Really being electric, pellets, charcoal, or whatever isn't a selling point for me. In fact I never have even heard or looked at a pellet grill until I seen a Traeger the other day at Costco. For me the fact that is CAN smoke, grill, and bake is a nice selling point. The only real downside is being stuck with using only pellets for smoke. From my research they offer pellets in various types of wood or are you thinking that pellets wouldn't do as well as say an actual piece of "oak" log or whatever? I've grilled with propane and charcoal both and I personally prefer charcoal. My current grill is just an old round Weber charcoal grill, but I'd really like to upgrade said grill once we're finished re-doing our back deck which is what got me looking now. Yes to the limited to pellets. I don't think they do any worse or better job than any other wood, but they're definitely more expensive. You might check Cabela's too, I think their pellet grills are made by Traeger, not sure if there's any price advantage. On weekdays I cook on a mid-90's Weber Genesis redhead that I purchased off CL and restored from the ground up a few years ago. Best cooking grill I've ever owned. It does indirect very well, and I can smoke small amounts when I add a couple of small cast iron smoker boxes. Weekends usually see the Weber Kettle that I purchased new in 1986. I installed a new vent/ash rake system and refinished the handles a few years ago. Still my favorite. being able to smoke is great, but it's primary use will be to grill as well. Would your linked Weber perform equally as well grilling? Yep, you can grill on it too. When I smoke or grill. I use the best tool I have for that particular job... If I want to bake, I have an oven in the house, LOL!!! Nothing imparts the taste of using real wood IMO... be it apple, pecan, oak, hickory or mesquite (some lump charcoal come close though). I personally would be skeptical of the claims made by pellet manufacturers without actually tasting meat actually cooked on their product. Spending $800 - $1700 based on their claims is a 'no-go' for me. I agree that grilling meat over charcoal (especially lump charcoal) gives much more palatable taste than propane. Propane is quick & easy, especially during the work week, but it not like eating meat grilled over lump charcoal. I have always said that if I could have only 1 grill, it should be a Weber Kettle. They're relatively inexpensive, they last a long time & can handle grilling like very few others. You can also use it to smoke if you set it up properly (I have posted numerous times how I do this). It will not be as good as using the big, dedicated smoker, but there are trade-offs in everything. Bear in mind that I'm an old fart & have accumulated numerous pieces of equipment that I consider essential... they each have been designed to last & to do their particular jobs well. I'm a Weber kettle guy. Like you mentioned above I grill on it 90% of the time but you can smoke with it. The kettle is not as convenient to smoke with and you can't fit 10+ racks of ribs but it works well enough for my needs. I used the 22.5" kettle for about 20 years - it lived outside all year without cover through Michigan, Illinois, and Indiana winters. Last year we had to move up to the 26" kettle which doubled the cooking surface. Back with the 22" kettle I made my own kettle-pizza insert for it to turn the grill into a wood fired pizza oven. That thing was great. There are a ridiculois number of accessories available for the kettle. I didn't even think about Cabela's for grills. We just got one in town not to long ago so I'll have to check them out as well. No, I never rely entirely on Amazon reviews - what's why I came here. Thanks for the link, some pretty interesting reviews. I too have been a Weber kettle guy, I have a smaller one that I've been using for the last several years. It's certainly showing it's age and a bit small - most certainly when we have people over. I was thinking about getting a "fancier" grill once the deck was done, but maybe I should just look at getting a new and bigger kettle again. Thanks again @w_r_ranch... reading more at that site you linked to and seeing awesome reviews for the Rec Tec grills and the forums are speaking highly of them too. What is a "smaller" size? There is the performer series in the 22" kettle that has a really nice built in table and several enamel colors. If you need to step up to the larger 26" kettle you get standard black. My local high-end nursery is also a Weber and Green Egg distributor. When I was last in there they had a 29" inner diameter big green egg. That thing was awesome looking, but you may want to take out an additional rider on the homeowner's policy for it. 18". They make a standard and a full-height version of the Smokey Joe. You can get it in a 37" version too, but you won't need a rider, you'll need a second mortgage! Green Mountain Grills vs Traeger – the ultimate smoker grill showdown. 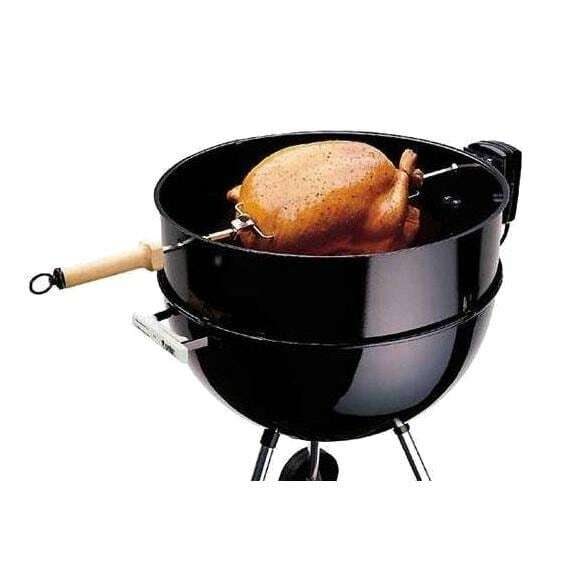 If you are looking around for the best smoker grill then you must first understand what makes a good smoker. Any barbecue or grilling enthusiast can tell you that food cooked over wood fire develops better flavors. While smokers and charcoal grills have been the traditional way to smoke or grill food, Green Mountain Grills and Traeger offer an innovative solution with less mess, maintenance and increased ease of use. By incorporating pellet-burning technology into a grill, you can control the heat with greater precision without the need for splitting or lifting heavy chunks of wood. Since their introduction into the industry, Green Mountain pellet grills and Traeger have not only been on the competitive edge against each other but they have also changed the way everyone looks at grilling.